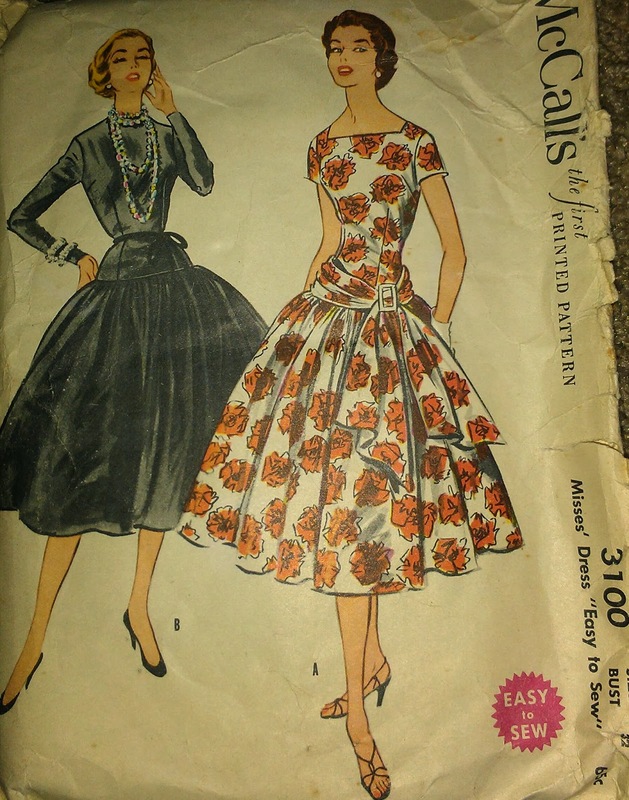 I was listing this beautiful pattern, McCall's 3100 (from 1954), in the store this morning, and trying to come up with interesting ways to describe it, as it came from the era before descriptions of the garment were written on the pattern envelope. I came upon the suggested fabrics and paused: taffeta, polished cotton, crepe, sheer wool, honan, shantung, cotton broadcloth, wool jersey -- and I stopped. Honan. What the heck is HONAN? a. a pongee fabric made from the filaments of the wild silkworm. b. a lustrous fabric simulating pongee and woven from fibers other than silk. a. silk of a slightly uneven weave made from filaments of wild silk woven in natural tan color. b. a cotton or rayon fabric imitating it. Compare Shantung, tussah. Tussah, I found, was a tan silk from India. 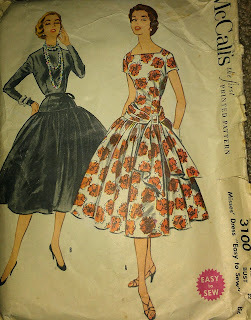 Personally, I would make this dress in taffeta, because I would want to hear the wonderful rustling, but I went looking for honan, and found that Vogue Fabrics doesn't carry it. They do, however, carry a lot of pongee, so at least I know what it looks like now. And though they don't carry honan, they do carry wool and silk tussah, in case you want to do some felting or spinning. Lovely pattern! That kind of drop waist would look terrible on me however. That's really interesting, and kinda sad how fewer fabrics are available today. You know, this is the Grace Kelly pattern, the one she wore on the cover of a McCalls catalogue and later, famously, on the day she met Prince Rainier. I saw her actual dress at the exhibition that travelled the world a few years ago, it was made up in what looked like a taffeta to me. You are so right about the swish, go for it!